Your day begins at dawn. Hopefully, you're waking up in a motor lodge on the high plains, getting the most out of that last night of a warm bed, waiter-served dinner, clean bathrooms, and sports on TV. At the end of this day, you will be setting up a base camp to use as your home for the next few nights in any one of the many scenic areas this country has to offer. Sure, it took three 400-mile days of two-lane highway to get here but, just ahead are the foothills, and beyond them, the mountain ranges with their panoramic motorcycling roads. This is really what you came for. At sunrise, I help myself to a free cup of coffee and continental breakfast and then walk out to my bike to remove its dew-soaked tarp. It takes several trips from my room to reload the bike with my repacked travel gear. I reattach the hard luggage and the soft tankbag and then bungee everything else onto the rear of the bike, making sure I have left nothing behind. It's shaping up to be a perfect day as I fire up the engine and hit the road. I look forward to the twisting scenic roads before me. I am in no hurry. My desired campsite will be a national park campground, and I should arrive about 4:00 PM. Between now and then, the day is there for me to enjoy to its fullest. I will stop frequently along the way, taking time to marvel at and perhaps photograph every vista. I will take short hikes to see geologic formations, stop for a casual lunch, and make my way across mountain passes and switchbacks as the motorbike purrs beneath me. I am in heaven on earth, so much different from my daily life, which is why this is called a vacation. I may put on a mere 250 miles today, but even that could take all day at the pace I'm traveling. My eyes are wide open and my senses are working overtime to soak up the beauty. I am not detached, but focused; after all, I am riding a two-wheeled motorcycle whose balance can be upset by any unexpected occurrence. Caution is the keyword. I have never collided with another vehicle and have not fallen down in the last 85,000 miles. I want to keep my record intact. I have brought a lot of gear with me and I don't want to see it scattered all over the road! Three o'clock approaches and it is now time to start thinking about setting up my basecamp. The national park is about an hour away as I contemplate what to cook for dinner. Steaks or barbecued chicken would be nice. That's what I shoot for. Of course, I will need to stop somewhere and buy the planned meal, since I carry almost no food with me and do not have a travel cooler on board. At 3:30 I pass through a town that has a Piggly Wiggly. Unless I run across another supermarket along the way, this is where I will have to double back once I set up camp. I could stop now and buy food and supplies, but I have no place to put it all! At four o'clock as scheduled, I arrive at the national park entry station, where I pay my entrance fee, pick up a park brochure, and head for the campground. Once I get to the campground, I traverse all of the loops and search for the best available site. 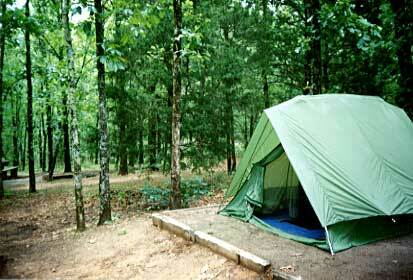 A good site must be heavily forested, secluded, and offer pleasant surroundings, since I will be here for a few days. I want to minimize the possibility of noisy neighbors and really don't want to stare at other people, so choosing correctly is important. A distant view is a bonus. I loop around a couple of times and find a good site in a corner of the campground. I stop my bike and get off to take a closer look. I proceed with my mental checklist: No current neighbors. No nearby toilet facilities with bright lighting or noisy pumps or generators. No garbage dump with clanging lids. A picnic table and firepit properly positioned. A smooth flat space for my tent. An adequate distance with foliage between me and any later arriving neighbors on adjoining sites. No loud cascading streams to keep me awake all night. That's about it. I really strive for the utmost quiet. I then lay claim to the site, ride back to the ranger station and fill out the necessary paperwork and pay fees to reserve the site for the night. If the site turns out to be a gem, I repeat this step on each of the following days. If for some reason the campground turns out to be a dud, I can always depart the following morning for better surroundings. I return to the campsite to set up camp. For the first time today, I move about rather quickly. I remove all the gear bungeed down to the back of my bike and proceed to set up my tent. Once the tent is up and staked down, I stow all the gear from the back of my bike--sleeping bag, air mattress, grill, etc.--within the tent, zip it up, and move my attention towards the procurement of firewood. I generally prefer to buy firewood since it is usually the driest when purchased. 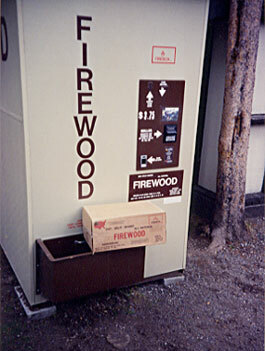 Firewood is often sold within the campground at specific posted times. If not, I have the choice of searching for small downed tree limbs to use, or looking for the sale of firewood as I double back to the market to buy my dinner. The rear of my motorcycle is now clear to strap down all supplies I will later obtain. It is now 4:45 PM. I should return from my trip to the market by six o'clock, giving me plenty of time to prepare and eat dinner and even make the eight o'clock lecture at the outdoor amphitheater. I hustle down the road and do not slow down until that first bite of food enters my mouth. At the market I buy steaks, frozen vegetables, fresh fruit, dessert, orange juice, ice, a small bag of charcoal, paper toweling, beverages, crackers, and maybe an appetizer like trail mix. This takes care of tonight's dinner, as well as tomorrow's breakfast and lunch. At the checkout counter I obtain a box to put everything in and then strap it down to the back of my bike. Upon re-entering the campground, I tie a bundle of firewood onto the seat behind me and carefully ride the remaining short distance to the campsite. 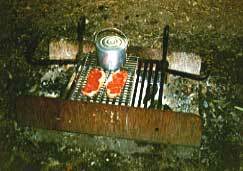 Back at camp, I opt for the ease of charcoal and save the firewood for my campfire later that night. 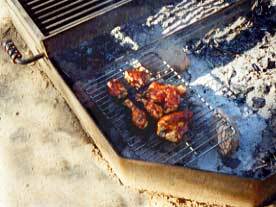 I place the charcoal in the firepit and use some rocks or firewood as supports for my grill. The charcoal is lit and I am twenty minutes away from placing the steaks on the fire. In the meantime, I get out a large trash bag to be used for all the trash I will accumulate that evening and another bag into which I load the ice to serve as my cooler. I fill up my collapsible water pouch with well water and hang it from a tree. I get out my hatchet and splinter some of the firewood to be used as kindling later that evening. Then I attach a rope high off the ground between two trees to be used for hanging whatever food and drink I will not lock up overnight in the hard luggage attached to my bike. (Must keep the predators at bay when I am not around to physically ward them off!) Time for a cold drink and an appetizer. The fire is ready for the pot with the frozen vegetables and a few minutes later, the steaks go on. By seven o'clock I am ready to sit at the picnic table to slowly savor my feast. Dinner alone amongst the trees--nothing quite like it! After dinner, I use paper toweling to scrape all the food remnants into the trash bag. I boil a pot of soapy water to be used to clean all the plates and utensils. As the water approaches boil, I have dessert. Then with the remaining daylight I clean up, rinse, and stow everything, followed by a general policing of the area. All food utensils are returned to the hard luggage attached to the bike. At the same time, I remove from my bike any gear I may need during the night and place those items either on the picnic table or inside the tent. On my way to the amphitheater, I take a flashlight and deposit my garbage bag in the appropriate dumpster. After watching a slide show presentation by a park ranger, I return to my campsite well after dark and start my campfire. I am now settled in for the evening. Around midnight, as the campfire dwindles; I gaze at the stars one last time and prepare for bed. I cover my motorcycle with a tarp in case rain arrives during the night and bring any remaining gear from the picnic table into my tent. I douse the few burning embers with water and make one final check to be sure everything is secure. I leave control of the campsite to the nocturnal creatures that will scamper about, occasionally waking me throughout the night.